The people of Beaumont, Texas, affectionately known as "beaumartians", live close enough to the Louisiana state line to have plenty of Cajun blood in them, just enough to be a little crazy around the edges. 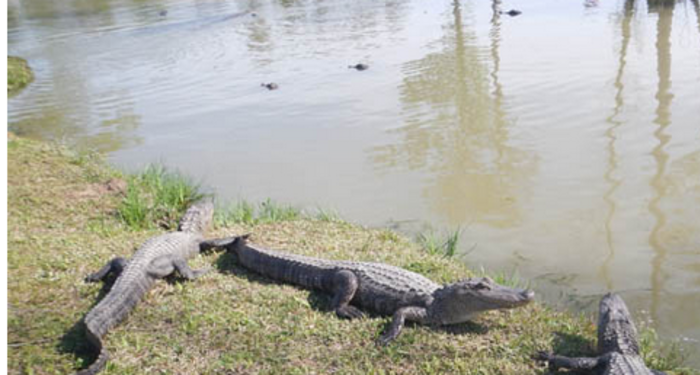 That&apos;s why in Beaumont one of the most popular things to do these days is to go biking with alligators. And the place to do it is in the city&apos;s waste water treatment facility. Seriously, the leaders of Beaumont were considered innovators more than 20 years ago when they tackled the problem of waste water management by working a little more closely with Mother Nature. Using a 250-acre natural wetland as the frame work, the city constructed an additional 900-acre wetland that serves as a natural filtration system for the city&apos;s waste water. The by-product, besides lower water bills and fewer chemicals in the city&apos;s water, has become a recreation area known for birding, biking and alligators. The area is called Cattail Marsh, located on the south side of the city, adjacent to Tyrrell Park and the Beaumont Botanical Garden. Because Beaumont is just 20 miles from the Gulf of Mexico and located on two major fly-ways, birds of all types love the Cattail Marsh. About 360 species have been identified here. Some of the regulars are the Whistling Duck, white-billed American Coot and the Glossy Ibis. The day we explored the marsh, we saw an Anhinga snake bird, something that is considered very rare for these parts. There were also plenty of pelicans, egrets and red-winged blackbirds. But what caught my attention more was the number of alligators. There were alligators everywhere we looked, piled on top of each other enjoying the sun or just poking their snout above the water level checking out the action around them. Mammas and their babies and big, tough looking daddy alligators were all around. And right there in the mix with the alligators were joggers, hikers, photographers and people on bicycles. "It&apos;s all safe," says Water Control Manager Karin Warren, "as long as you remember to give the alligators plenty of space and always the right of way on the bike path." No one had to remind me twice of that little tip. An alligator can run about 20 mph for a short distance and here&apos;s hoping you can pedal faster than that with the right motivation. Cattail Marsh has 12 miles of gravel covered trails on the tops of levees that control the 650-acres of water. The city of Beaumont is in the process of building observation towers for birders and boardwalks across the marshes for a greater variety of experiences. Trail maps can be downloaded from the Beaumont CVB website for this and other biking/birding trails in the community. If biking/hiking that close to alligators is a little more stimulation than you care for, instead take time to explore Tyrrell Park on two wheels or two feet. The city&apos;s golf course is here along with horse stables and plenty of trails for those horses, along with the Beaumont Botanical Garden, known for its azalea trail and camellia garden. Or if you want even more interaction with alligators, plan a visit to Gator Country, a wildlife park near Beaumont where guests can actually pet an alligator and have your picture made on it. The park has about 350 alligators including an 80-year-old guy named Big Al, who weighs about 1,000 pounds and doesn&apos;t seem to like people very much. Smart people keep their distance. Whats the closest you&apos;ve been to exotic wildlife?